Cited as "inventive world music and outreach" on both the band's web site and the festival site, and described as "Israeli peace songs and Sephardi canticas meet Bahian street beats and blues," let's just say that this isn't your typical down-home string band. 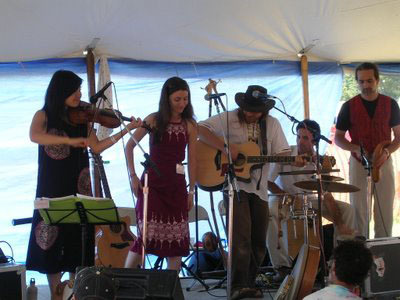 While many of the groups performing in the festival are native to Vermont or New England, Israeli-born musician Guy Mendilow has lived in Israel, South Africa, and Brazil, and members of his band hail from Japan, Israel, Argentina, and oh yeah, the U.S. So we've got the "world" piece down, but where does the "outreach" come in? The band has been partnering with international peacemaking organizations, the most recognized of which is Seeds of Peace, the international youth leadership organization found in 1993 by journalist John Wallach. The main camp, which is located in, um, Maine (Otisfield, to be exact), plays host each summer to teens for conflict-ridden countries and leads them in dialogue, in hopes that they will "open lines of communication" between peoples. Mendilow, according to his site, believes that "music, and music making, can play a unique role in the effort to transform “the other” into a fellow human being to whom one can at least listen, if not necessarily agree." Thus, music, in his mind, can bring together various people in a way that nothing else can. World, check. Outreach, check. So now, on to "inventive," which the band's latest album, Skyland most certainly is. Each track is a curious and eclectic blend of sounds, styles, and languages. In "Sala'am," a bluesy harmonica is combined with an upbeat tempo and harmonies sung in hebrew. The harmonica, and guitar, however, are just about the only instruments that I was able to recognize and name; the band plays a wide range of ethnic instruments including the Cajon, which is basically a plywood box with sound-hole cut out of the back side, is an Afro-Peruvian mainstay. The Electric Mbira and Berimbau and other woodwind instruments are also featured in this hard-to-pin-down sound. Confused? So am I. And I just discovered that the "harmonica" that I was relieved to hear was actually a "jaw harp." So, be sure to take your lunch break on the Green from 12 to 1 on July 16, and in the meantime, check back here on Thursdays for more musical murmurings and band profiles as we continue to count down to the Festival, blog-style. Online editor's note: Check back next Thursday for another update in the "Countdown to the Festival on the Green" series by Addison Independent intern Tamara Hilmes.